THE PROPOSED AGREEMENT PROTECTS YOUR TAKE-HOME PAY. ESTIMATE YOUR NEW WEEKLY PAY UNDER THE PROPOSED AGREEMENT. How to vote for the proposed Woolworths Agreement. Securing a new Woolworths Agreement is the best way to secure your pay and conditions over the next few years. It’s important for you to have your say and make an informed decision about what is best for you. Voting is open from Thursday 11 October at 8am (AEDT) until Monday 22 October at 8pm (AEDT). You will need your payroll ID and Date of Birth to vote. 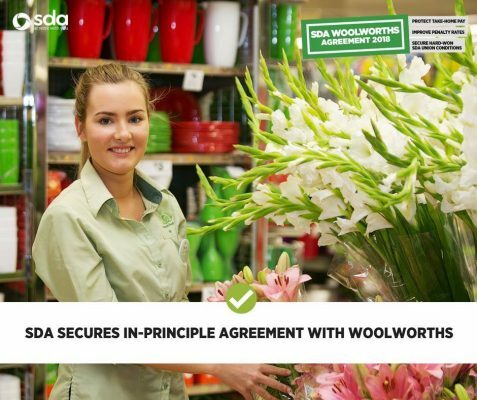 The SDA has now reached an in-principle agreement with Woolworths for a new Woolworths Supermarkets Enterprise Agreement. Negotiations with the Company, took place over 25 days throughout this year and involved significant complexity given the change under consideration. SDA store Delegates recently met throughout Australia to hear a detailed report on the progress of negotiations for a new enterprise Agreement. SDA Delegates endorsed the negotiations and authorised the SDA to finalise a new Agreement. To ensure the best possible outcome for Woolworths workers, the SDA deployed its most experienced negotiating team. Improved early morning, weeknight, Saturday and Sunday penalty rates. A one-off payment of up to $1100 in cash and gift cards (depending on hours worked and length of service). An above award rate of pay for every hour of every day. A laundry allowance payable to workers who wear preferred dress or launder a uniform. Most of the superior conditions from the current Agreement including voluntary work on public holidays and 15-minute tea breaks. Protections for take home pay of current employees. 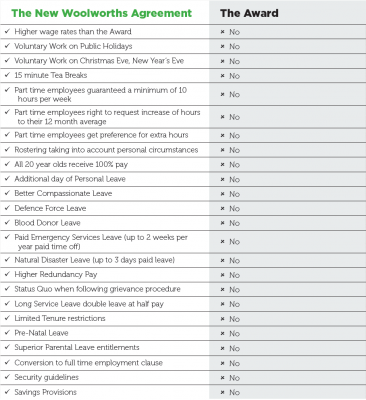 Better rostering conditions- including removal of the 20% hours reduction provision for part timers. A clause allowing casuals to convert to part time. The in-principle Agreement is subject to drafting and soon SDA Organisers and Delegates will be briefing Team Members on the proposal. It will then go to the Fair Work Commission to be approved. The AWU (in North Queensland) and the AMIEU (Meat Union) have joined with the SDA in reaching in-principle agreement Woolworths. Voting on the proposed Woolworths Agreement will take place in an online ballot from 11 – 22 October 2018. 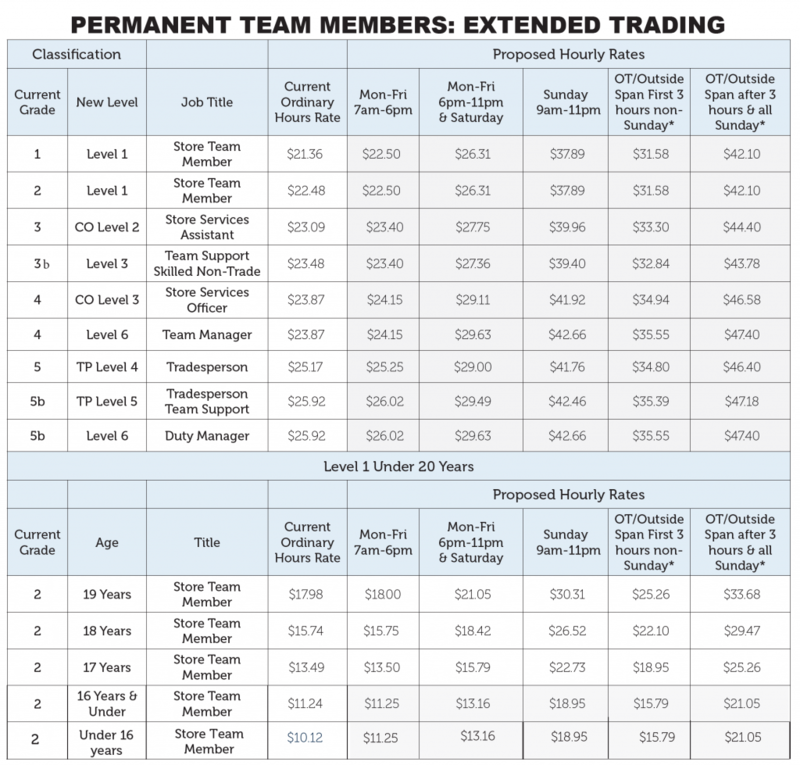 Below are the proposed new hourly rates of pay. These rates of pay only apply in Western Australia. If you don’t work in WA, please click here. A new Laundry Allowance of $1.25 per shift ($6.25 per week for full-time) applies in addition to the rates below. *Work outside the span of hours is paid at the overtime rate of 150% for the first 3 hours and 200% thereafter. On Sunday work outside the span is paid at 200%. * The new span of hours will be 7am to 11pm Monday to Saturday and 9am to 11pm on Sunday. *Work outside the span of hours is paid at the overtime rate of 175% for the first 3 hours and 225% thereafter. On Sunday work outside the span is paid at 225%. *The new span of hours will be 7am to 11pm Monday to Saturday and 9am to 11pm on Sunday. Estimate your weekly pay under the proposed Woolworths Agreement using our online wages calculator. The proposed Agreement moves from the existing model of a higher base rate of pay with lower penalty rates to a model with higher penalty rates and a lower base rate. The SDA needed to make sure no-one on higher base rates will be worse off. Click here to estimate your weekly pay under the proposed Agreement. 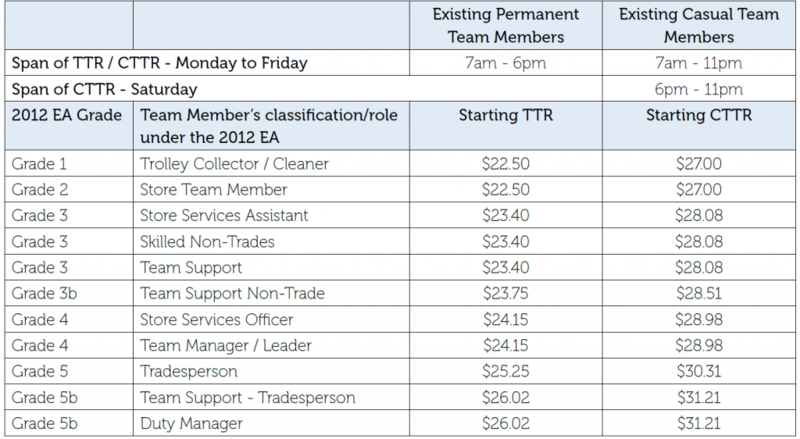 Existing team members employed as at 22 October 2018 will receive the new base rate of pay plus an additional payment to increase their effective base rate called a Temporary Transition Rate (TTR) or a Casual Temporary Transition Rate (CTTR). 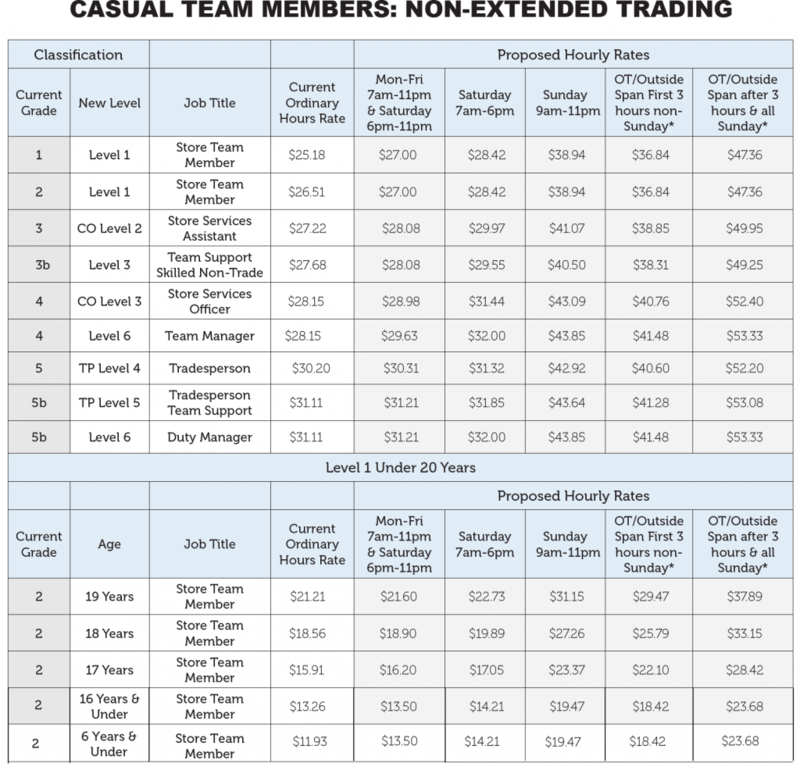 The proposed Agreement contains a new base rate of pay for each classification. 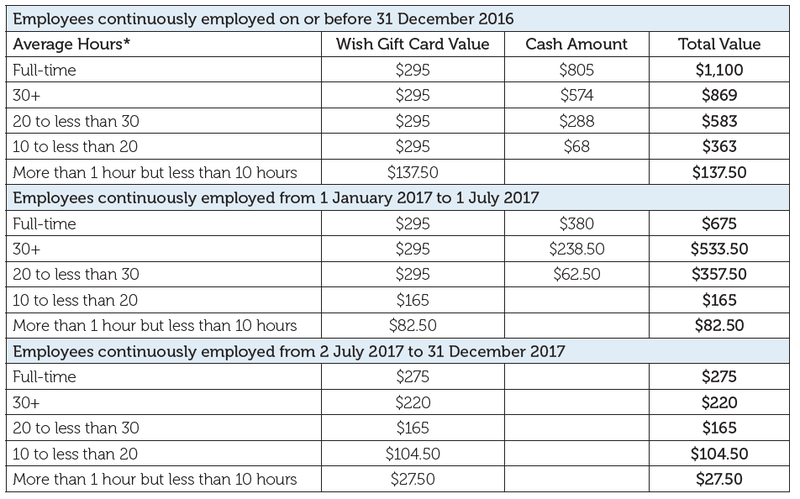 This rate of pay will be used for new employees in non-penalty rate hours and will also be used as the base rate of pay to calculate rates of pay in penalty rate hours for new and existing employees. The proposed Agreement has a new classification system which includes new numbering and job descriptions and is in line with the Retail Award. There will no longer be an introductory rate of pay (the old Grade 1 rate) which means that the current Grade 2 has been renumbered as Retail Employee Level 1. Base rates of pay, penalty rate time rates of pay and protected TTR/CTTR rates will increase from July 1 each year. Increases to these rates of pay will be based on the pay rise the SDA, with the ACTU, secures at the Fair Work Commission in the Annual Wage Review (AWR). TTR/CTTR increases will be capped at 1.75% per year. Public Holiday penalty rates have been reduced in line with the Fair Work Commission’s penalty rate decision. The proposed Agreement mirrors the penalty rates in the Award which includes the recent Fair Work Commission decision that reduces Sunday penalty rates over the next two years. However there is a clause in the Agreement that ensures that Sunday Penalty Rates will move in line with changes in the Award up or down. The SDA has ensured there is a clause in the proposed Agreement that means that if the SDA wins these increases to penalty rates in the award- they will apply at Woolworths. The vast majority of team members wear Woolworths preferred dress. Allowances may increase over the life of the proposed Agreement and will not be less than in the Award. The proposed Agreement introduces Shiftwork provisions. Team members need to be engaged specifically as a Shiftworker by Woolworths. No current team members are engaged as Shiftworkers. Existing team members can only become a shiftworker by mutual agreement. Shiftworkers receive different penalty rates and their hours of work are restricted so that a shift has to start after 6pm and must finish after 11pm but before 5am the next day (except early morning baking shifts that start between 2am and 6am). There are also specific Baking Production Shiftwork provisions. No current Team Members are engaged as Baking Production Shiftworkers. Existing team members can only become a Baking Production Shiftworker by mutual agreement. NSW Union Picnic Day will apply in 2018 and is saved for the first 3 years of the proposed Agreement in 2019, 2020 & 2021, but not in 2022.
payment for employees who have worked through that period. The payment will be made within 14 days of the Agreement being approved by the Fair Work Commission. Agreement and who remain employed up to the payment date. Woolworths have reserved the right to pay the bonus earlier than that date if possible. The payment will be made as a combination of Wish Gift Cards (tax free) and cash, depending on the amount. Average Hours* is based on actual hours worked in May, June and July 2018. The SDA has fought hard to deliver the best possible outcome for Woolworths workers and the framework of the proposed Agreement has been endorsed by hundreds of SDA Delegates from Woolworths at meetings across Australia. You can vote for the Agreement online at www.eavote.com.au between 11th of October and 22nd of October 2018. Read the draft proposed Woolworths Agreement. If you have any questions, please contact your local SDA Branch. The SDA and Woolworths met today and have made further progress towards finalising a new Woolworths Supermarkets Agreement for you to consider. With the support of SDA Members across Australia we will continue to fight for the best pay and conditions possible at Woolworths. Thank you to all Woolworths workers who are working hard through the change of new bans on single-use plastic bags. We continue to support our members on this issue and recognise that while this is a change many customers and the wider community support you and your efforts during this transition. Remember your rights under the new rules, to report all incidents of abusive behaviour and to always follow safe work practices. Reporting incidents help to strengthen our case for better protections for workers. The SDA is working to finalise a new Agreement as soon as possible that will be available for Woolworths employees to consider over the next few months. If you have any questions, please call the SDA. SDA and Woolworths have met over the past two days as part of negotiations for a new Woolworths Supermarkets Agreement. (SA only NT only) Public Holidays to be recredited during periods of long service leave. No 20% reduction in hours clause. 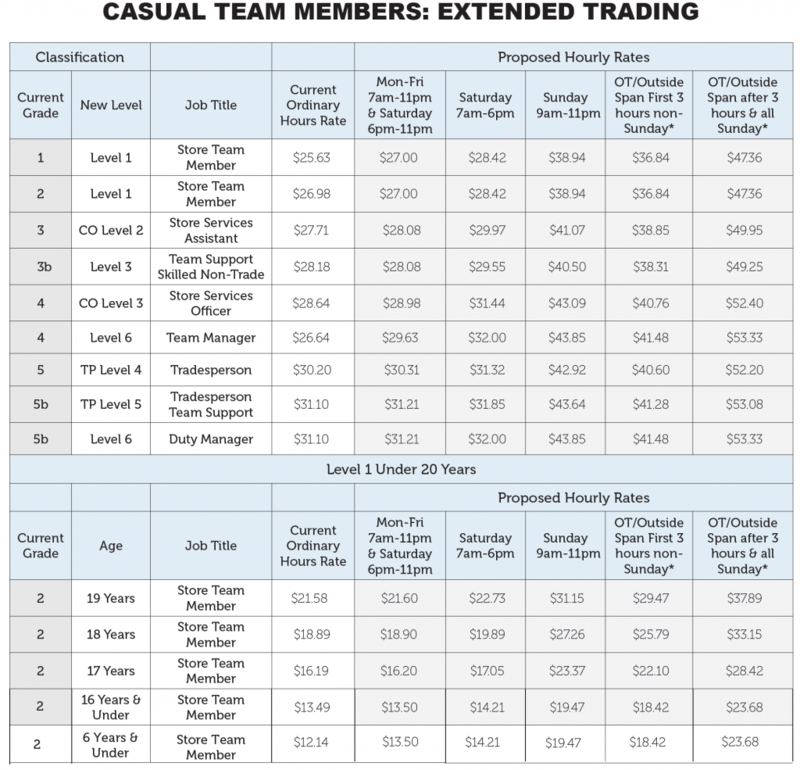 A clause to allow casuals to convert to part-time or full-time. Protection of better breaks provisions. Protection of the higher personal leave entitlement. The right to an RDO for full-time staff. The SDA also continues to press for the Company to provide uniforms to staff, free of charge. The SDA has continued to call on the Company to pay an increase in wages. We expect the next meeting to focus on wages and a wage increase. You can add your name and call on Woolworths to pay a wage increase below. Now more than ever it is important for members to support the negotiations by encouraging everyone in your store to be a member of the SDA so we can secure the best possible wage increase. We will continue to keep you updated as negotiations progress. The SDA met with Woolworths today as negotiations for a new Woolworths Agreement continue. Remember, you will have the final say when it comes to any new Woolworths Agreement. When negotiations are finalised the proposed new Agreement will be put to Woolworths workers in a vote. Retention of leave rights for emergency services, natural disasters, pre natal matters, blood donor and defence force services. Remember, no proposed Woolworths Agreement can be put in place without a vote of employees. You will have the final say when it comes to any new Woolworths Agreement. If you have any questions, please call your local SDA Branch here. The SDA has met with Woolworths several times over the last month to negotiate a new Enterprise Agreement that will secure your pay and conditions. Penalty rate of 25% on weeknights from 6pm for permanents. Penalty rate of 25% on Saturdays for permanents. 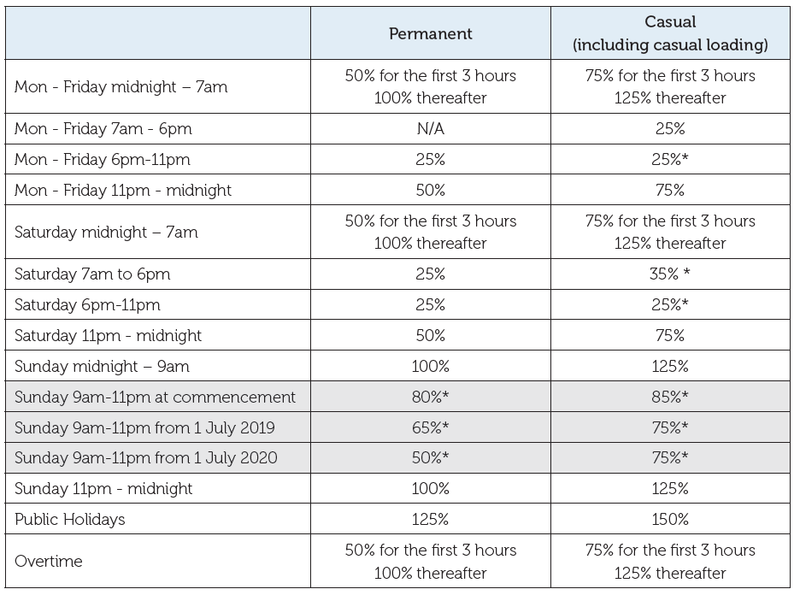 Penalty rate of 35% on Saturdays for casuals (inclusive of casual loading). Penalty rate of at least 50% for work before 7am on weekdays. Casual Loading to increase to 25%. Progress has been made to secure these higher penalty rates during negotiations. By supporting the SDA you are helping us secure better pay and better conditions at Woolworths. We’ll continue to update you as they progress. Today the SDA met with Woolworths as part of negotiations for a new Woolworths Agreement. Expansion of the RDO of Full-time staff. Existing break entitlements to be maintained, including 15 minute tea breaks. 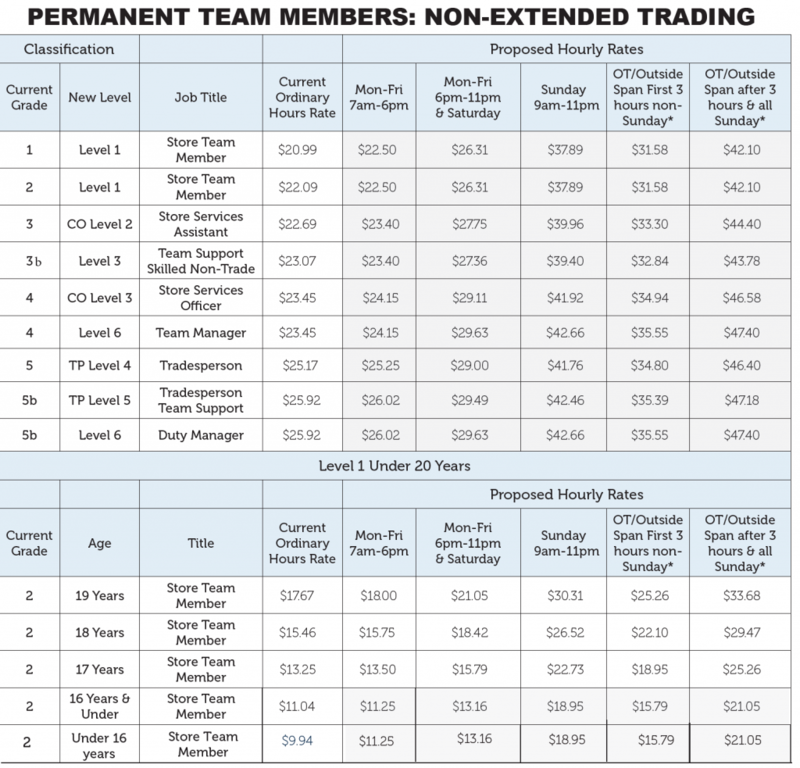 Access to additional hours for part-time staff. Retention of above award leave provisions: blood donor, defence force services, emergency services, natural disaster and prenatal. You can find our full log of claims here. Our next meeting is on 21 February. Remember, no proposed Woolworths Agreement can be put in place without a vote of all employees. You will have the final say when it comes to any new Woolworths Agreement. If you’re not an SDA member, now is the time join so you can help us protect your pay and conditions. Find your local SDA here. SDA and Woolworths Start Negotiations! Today the SDA met with Woolworths to begin negotiations for a new Woolworths Agreement. Late last year, Woolworths SDA Delegates from across the country came together to discuss our approach to negotiations. It is our priority to protect what SDA union members have fought hard to achieve over decades of bargaining. Consistent with our approach, which has been endorsed by Delegates, today the SDA has tabled our log of claims and the Company provided their opening position. We thank our SDA Delegates and members for their support and hard work to ensure Woolworths workers get a fair go. If you have any questions about this or any other workplace matter, please contact the SDA or speak to your SDA Delegate or Organiser. 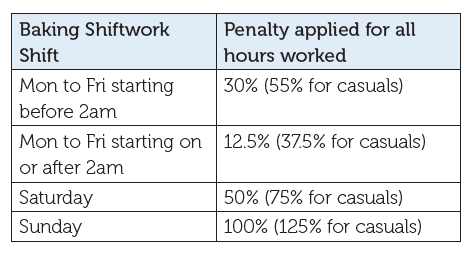 Also- The SDA is running cases to increase penalty rates for casuals at the Fair Work Commission. A key claim for the union is to ensure if we win these cases – that they will apply to Woolworths staff. Bargaining for a new Woolworths Supermarkets Agreement set to commence. For sometime the SDA has been calling on Woolworths to immediately pay a wage increase to Woolworths workers and recommence negotiations for a new Woolworths Supermarkets Agreement. The Woolworths Supermarkets Agreement is what sets your pay and conditions at work. Prior to Christmas at meetings throughout Australia hundreds of your SDA Workplace Delegates endorsed the SDA’s call for Woolworths to pay a wage increase and recommence bargaining. The SDA has met with Woolworths, and we have agreed to commence bargaining for a new Woolworths Supermarkets Agreement in early February. The best way for the SDA get you pay increases into the future and protect your hard-won SDA Union conditions is through a new Enterprise Agreement. That’s why commencing bargaining is so important. We will keep you updated with major developments as negotiations progress. No new Agreement will come into place without first being voted upon by Woolworths Supermarkets employees. If you have any questions, please call your local SDA Branch here. Not a member? Join at www.sda.org.au. JOIN OUR CAMPAIGN TO PROTECT THE PAY AND CONDITIONS OF WOOLWORTHS WORKERS.